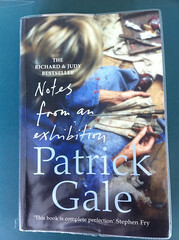 More fab fiction from Patrick Gale. Set largely in Penzance, Notes From An Exhibition tells us about the life of modern artist Rachel Kelly, and the impact bipolar disorder has on her life, her creativity and family. Each chapter prefaced with an information card from a posthumous exhibition of her work and belongings, it’s a beautiful novel.